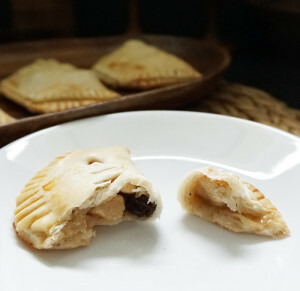 I’ve made hand pies of this sort for a while and still can’t figure out what to call them. 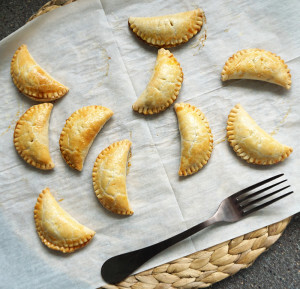 Are they hand pies, turnovers, tarts, pasties? 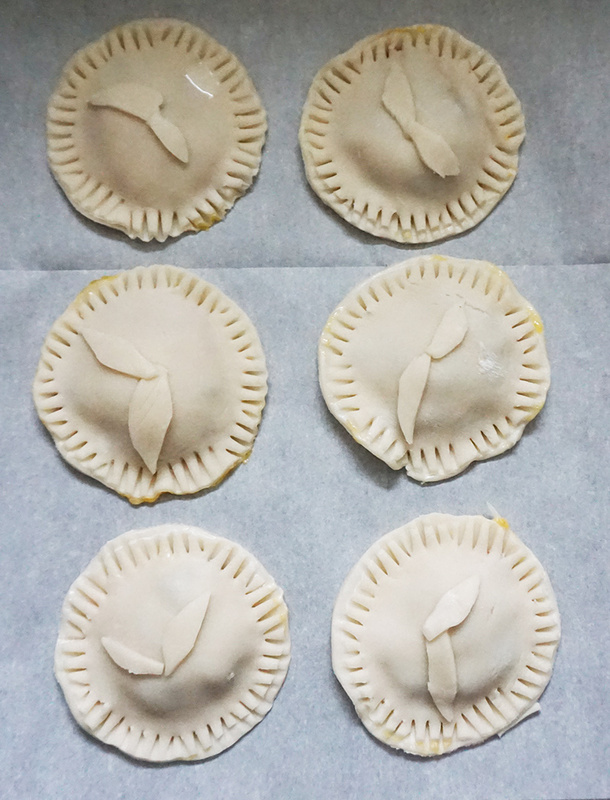 I can’t seem to find definitive terms for these things, so I’m just choosing pasties for these bacon, date, and cheddar pasties to honor my mum’s British nationality. Feel free to school me in the comments. 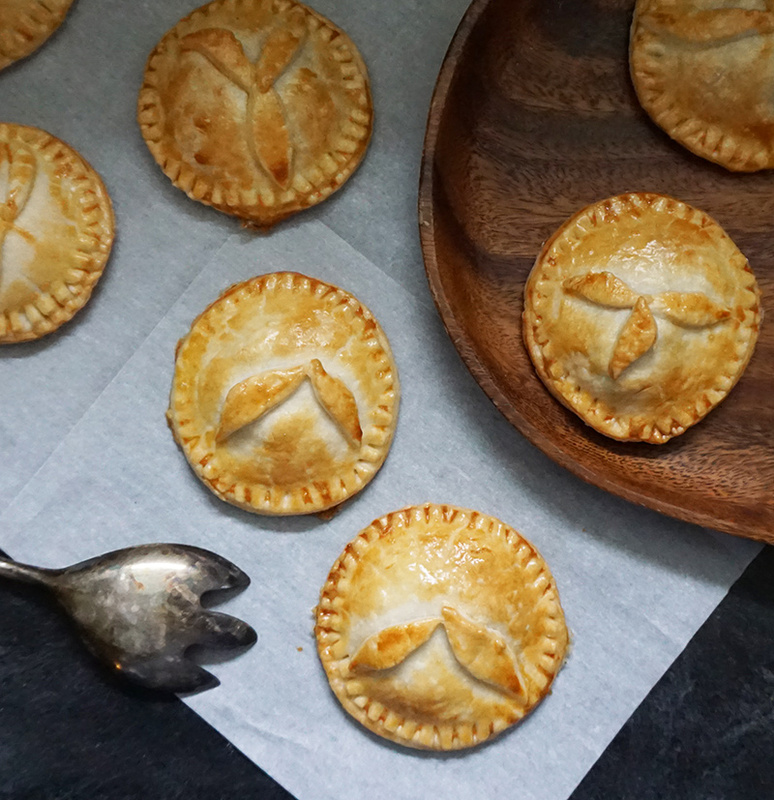 Let’s see, this is the third pasty-type of pastry I’ve made and they’re almost on par with my very favorite, these Harry Potter-inspired pumpkin pasties (savory and sweet!). Those were more like turnovers in that I made them half moon-shaped. 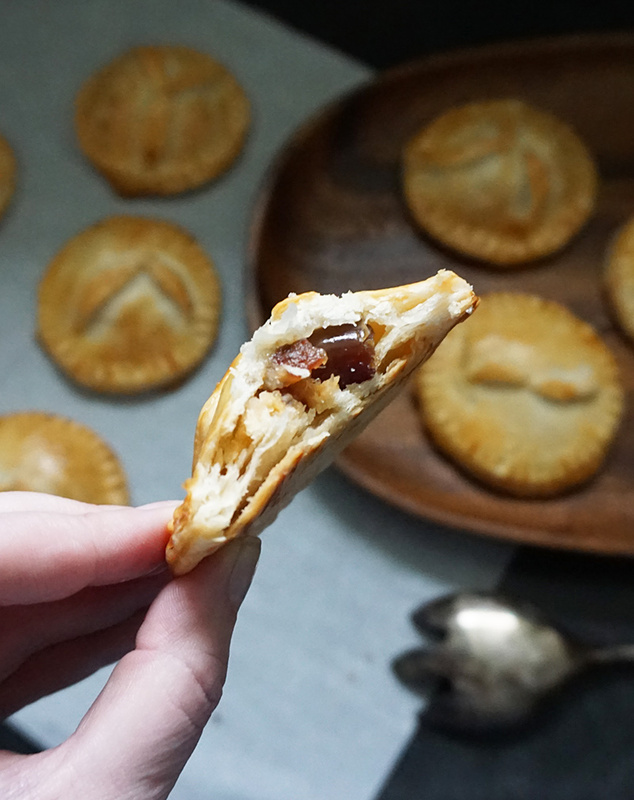 These bacon, date, and cheddar pasties are sweet little round things with some leaf decoration action going on. Totally optional, natch! 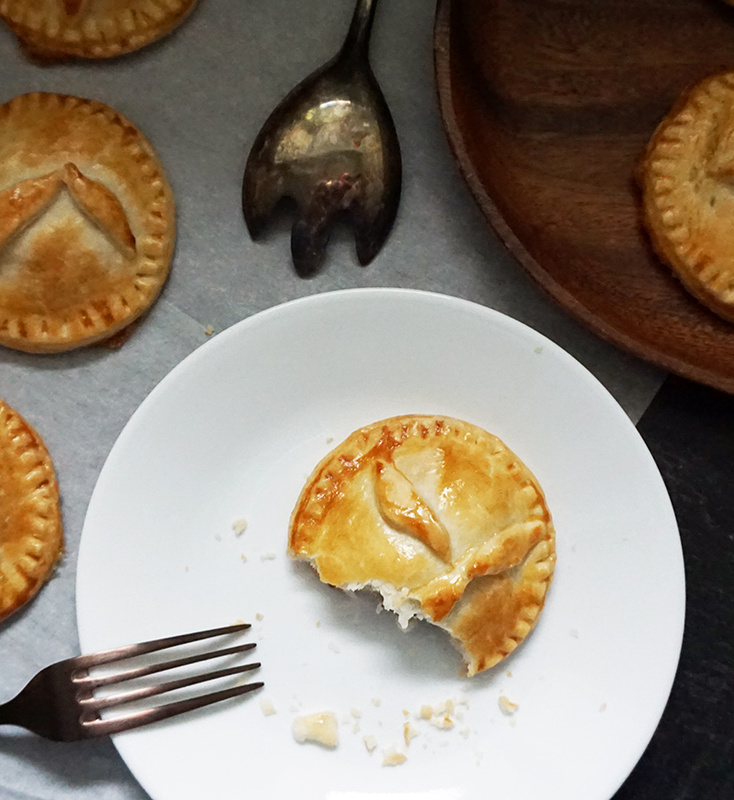 Actually, now that I’m looking, both of my previous hand pies were geek-inspired. 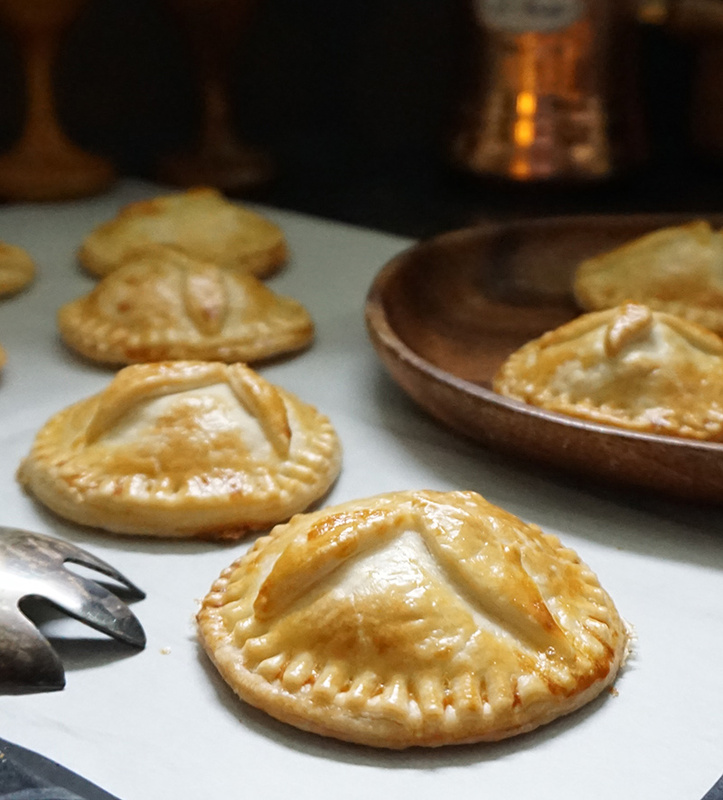 Harry Potter, of course, and my last one which were Game of Thrones-themed rustic honeyed chicken hand pies. I liked that those were a little rougher around the edges for the theme. 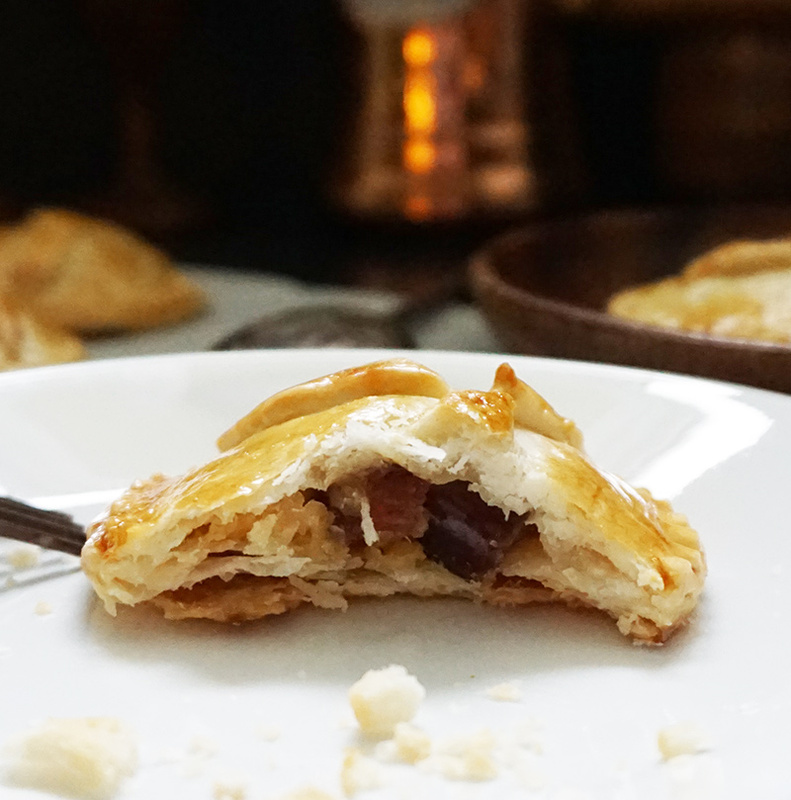 These bacon, date, and cheddar pasties are a little more done-up and fancy. 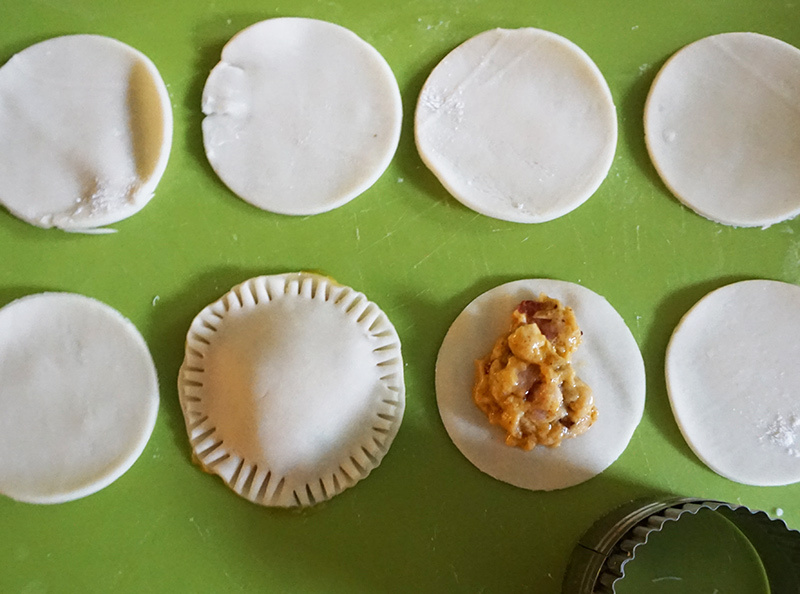 You can, of course, craft these pasties any way you like. Fold them over, twist or fold the edges, bake them in a cupcake pan, whatever floats your boat. 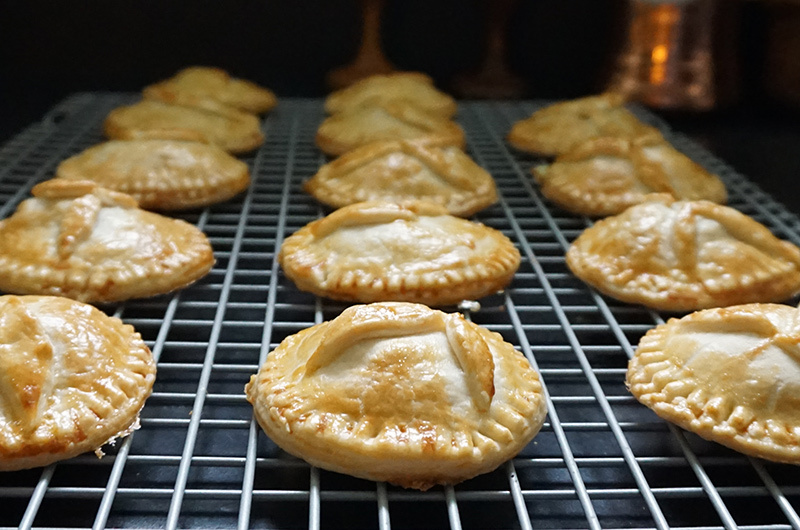 If you do opt to do the double pastry rounds like I did, try to pack in a bit more filling than you would otherwise just to make sure it doesn’t become pastrypalooza with only a little filling. I did have to do two versions of these as the first had a leeeettle too much oil. Cooking the bacon produces as much oil as you need for this recipe. So if you’re tempted to add oil or butter to the pan during the roux phase, I’d suggest skipping it. Speaking of roux, we’re pulling out ye old roux to make the cheese sauce in here. It’s not unlike this three-cheese brown butter truffle mac and cheese, so you’ll end up with a kinda-sorta mac and cheese sauce filled with onions, bacon, and dates. Not jazzed about adding fruit to this? Give it a shot, trust me. It adds just the right amount of sweetness to all the cheesy savoriness. Cook the bacon in a skillet until sizzling and lightly browned, if not already cooked. 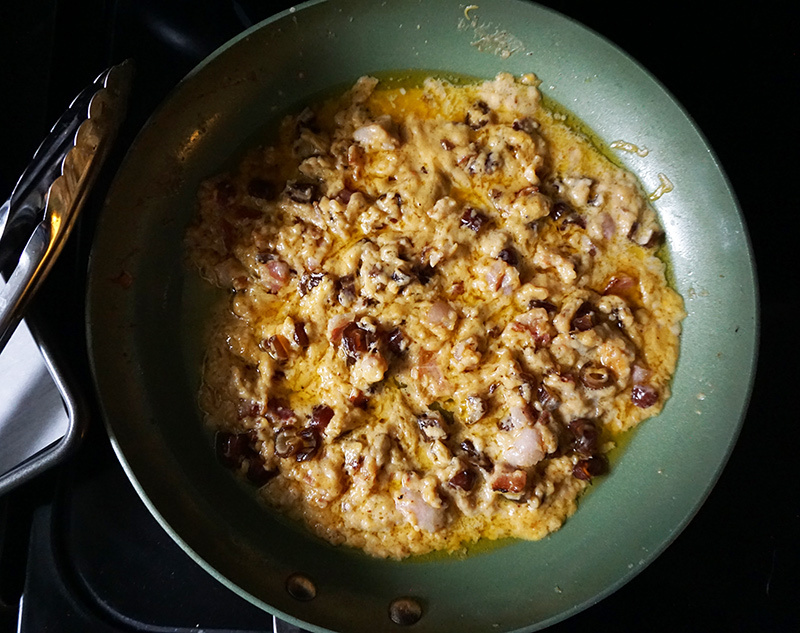 Remove from the pan and add the chopped onions straight into the bacon grease. Cook for 4-5 minutes until softened and starting to be translucent. Sprinkle the onions with the flour and stir well to coat. Add the milk and turn heat to medium-low for 3-4 minutes, stirring well, until the liquid is smooth and has thickened slightly. Add the cheese and stir well. Add the bacon to the pan and season to taste with salt, black pepper, and rosemary. Stir again. Add in the chopped dates, stir to combine, remove from heat, and set the filling aside. 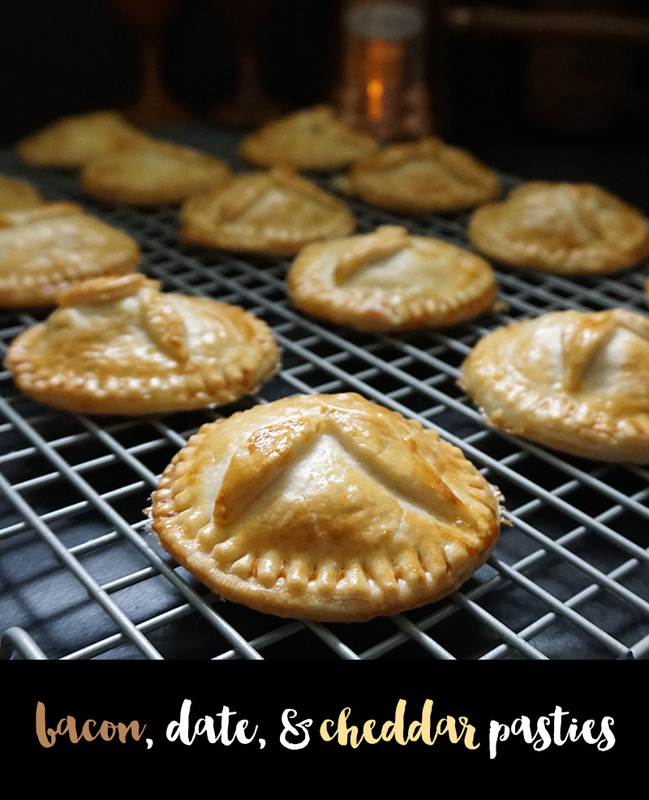 Using a pastry cutter or a glass with a 4- or 5-inch diameter to cut circles from your dough. Place about a tablespoon of filling into the center of each circle, then brush the perimeter of the circles with a small amount of water. Place another circle of dough on top, and press the edges down. 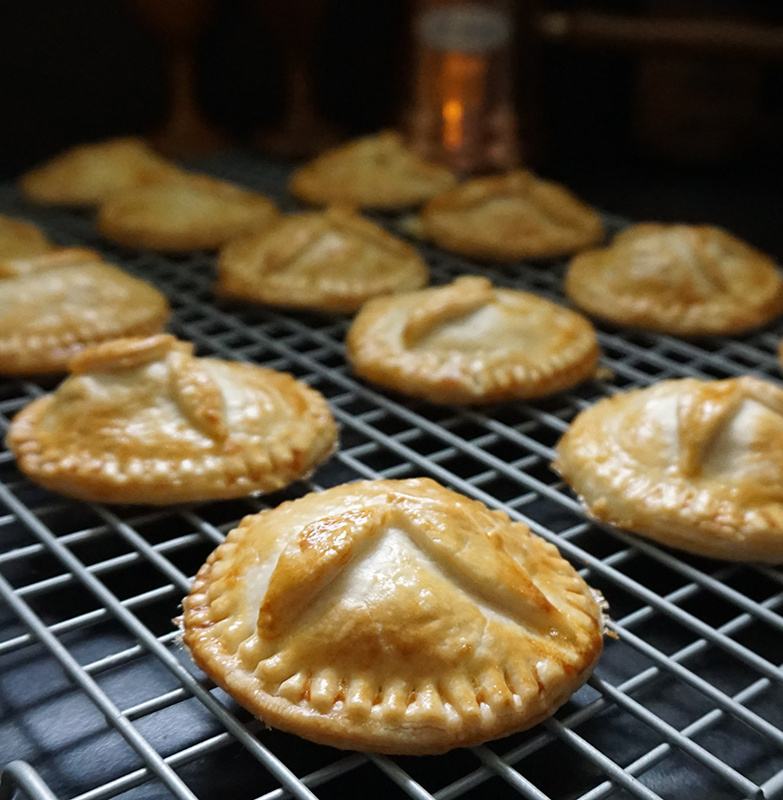 Crimp or use a fork on the edges to seal and place the pies on a large baking tray covered with parchment. 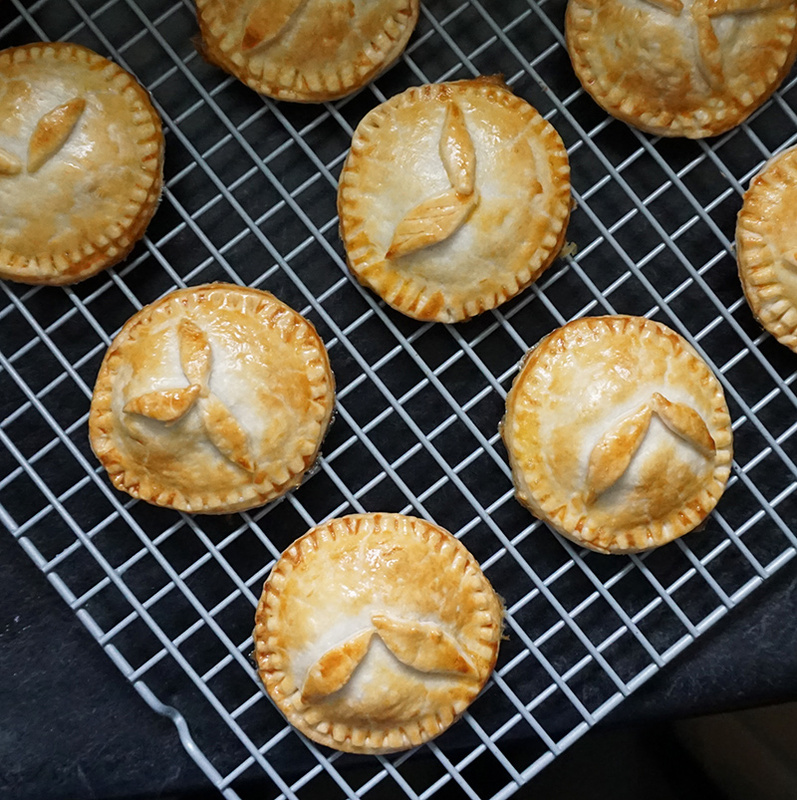 Brush the tops of the pies with egg wash.